It seems like forever since I last made a card! Been missing my mojo, so if you find it somewhere please send it back to me!! I used this cute Whiff of Joy stamp and I really LOVE the sentiment stamp! 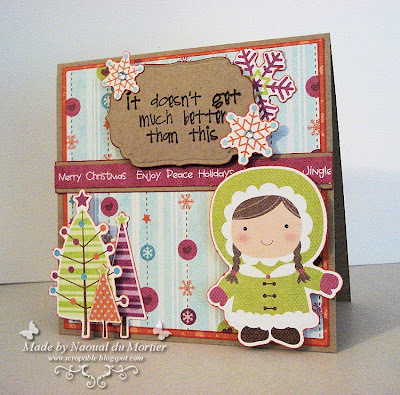 Tools: Borderpunch; Fiskars, Nestabilities; SpellbindersThanks for stopping by! 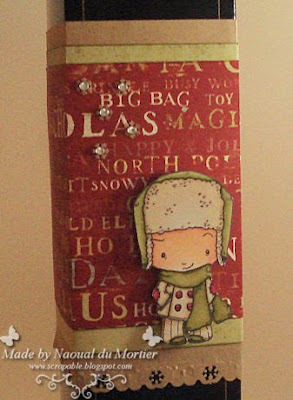 With the season of holiday parties upon us, what BETTER challenge to issue than to create a HOSTESS GIFT The challenge will go through DECEMBER 30th, 2011 at 8pm CST. 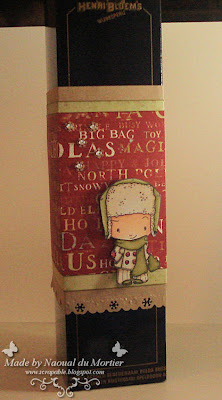 Just upload your Hostess Gift idea using TGF Stamps to the TGF Galleria>Contests/Challenges>Hostess Mostest Challenge. The WINNER of this challenge wins ONE sweet slice! That's right! We have a CHEEKY CHERRY PIE stamp up for grabs....but there's MORE....hmmm, like how about the ENTIRE JANUARY RELEASE?!? That's right! This is HUGE prize and there is plenty of time to play! For this challenge I decided to decorate a bottle of wine, doesn't Oliver look adorable?! SO cute!! It's time for another installment of Farm Fresh Friday. This week's challenge is a Scrapbook challenge. All you have to do is Get SENTIMENTAL with a quote, phrase, or favorite poem that reminds you of someone you love :) There's a prize for one lucky participant! This week's challenge prize is a fabulous one! 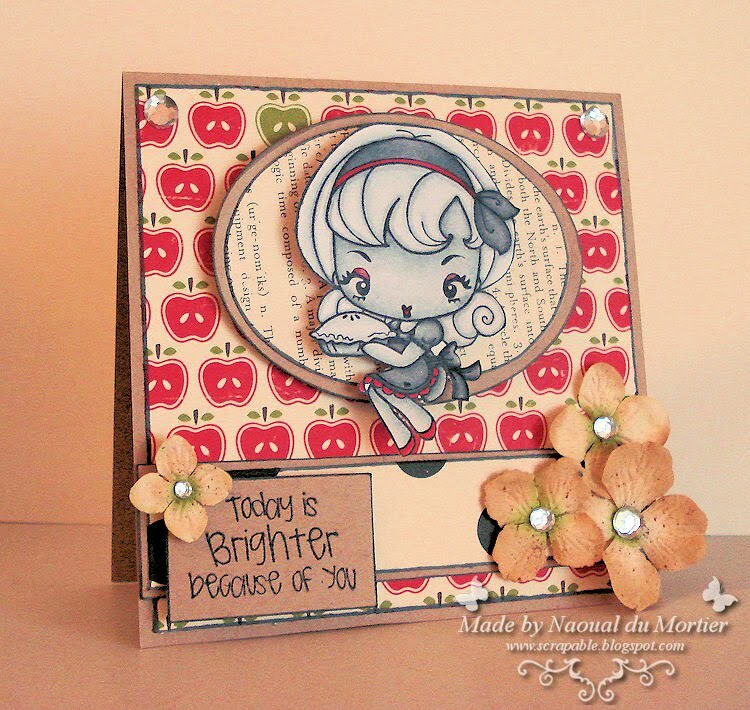 It's "Because of You" the newest Sentiment stamp set from the Farm. 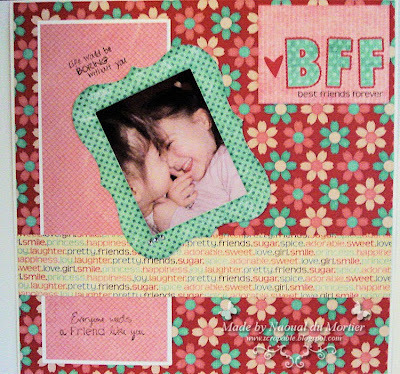 Just upload your LAYOUT to TGF Galleria>Contest/Challenges>FFF>Get Sentimental You have through Wednesday, December 15th to play along-good luck! I used 2 stamps of the new sentiment stamp set "Because of You", LOVE that set!! Farm Fresh Friday - Let it SNOW! I loved being part of the previews, SO much FUN!! Did you girls get your fave stamps already? This week's challenge is to use some kind of snow or snow element (snowflakes, liquid applique, glitter, flowersoft, etc.) on your project this week! Don't forget to play along this week, the prize is the new & cuddly Oliver & Amelia 'Fuzzy Wuzzy'-a FULL 4x6 set! HOPPIN' into the HOLIDAYS with The Greeting Farm!! There is excitement in the chilly air tonight as the TIME. HAS. COME...to HOP into the HOLIDAYS with The Greeting Farm! Hooray! We have been looking forward to doing an all-customer invited Blog Hop for QUITE some time now and are thrilled that tonight's the night. If you are just getting here, be sure to start on the TGF Blog where there will be ONE official list of hoppers due to the volume of tonight's hop. Be sure to pop in between 7 and 8 pm CST on our PCP page to chat w/ the DT, drink virtual egg-nog and be MERRY with TGF! I used this weeks Sketch Saturday sketch for this card. Isn't she DREAMY? That's right-in case you were wondering why we were STARTING with the DT tonight when most hops have ended with us, THIS is why! You won't want to miss her as we KNOW she's gonna go FAST-so be sure to grab her any time after MIDNIGHT TONIGHT, CST, when ALL the December TGF releases go live and for sale! If you are participating in one of our contests tonight (see THIS post for categories), the THREE categories will be live and posted in the TGF Galleria at 7pm CST tonight. Please place your card in the appropriate category in the galleria NO LATER than 11:00 AM tomorrow, December 1st. 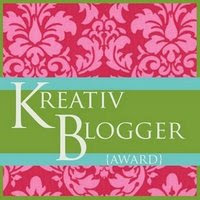 Winners will be drawn tomorrow around NOON CST and posted on the TGF Blog. 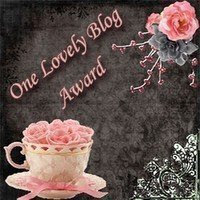 In addition, the TWO lucky Blog Hop winners (must have left comments and completed blog hop by NOON CST (This gives our overseas friends as well as here in the states plenty of time to see the projects and comment :) will be announced at NOON CST as well on the TGF Blog. GOOD LUCK to everyone and GET HOPPIN'! Thanks so much for stopping by and for HOPPIN' into the HOLIDAYS with The Greeting Farm!